A proposed design for the new Jefferson Park Golf Clubhouse, as viewed from the Beacon Avenue side. 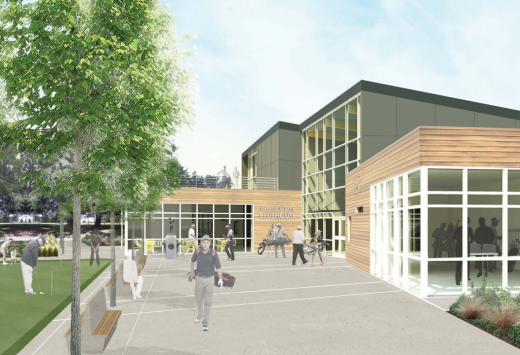 Advance notice — this Friday, October 26, at 9 a.m., the Seattle City Council Planning, Land Use, and Sustainability Committee will meet to discuss (and possibly vote) on the Jefferson Park Golf Clubhouse project. There will be a public comment period at the beginning of the meeting according to an agenda distributed yesterday. Council land use action to allow a new 19,800 square foot two-story clubhouse and driving range structure, a new 4,1 00 square foot cart storage structure and 20,000 square feet of paving improvements, including a request to waive development standards to allow field lighting up to 90 feet in height and netting and net poles up to 140 feet in height (Project No s. 3012845and 3013107, Type V). The new clubhouse has been the subject of some controversy, with some wanting the old clubhouse preserved, and others who want the new clubhouse built. Read more about the clubhouse in our Jefferson Park Golf Clubhouse archive here. Previous PostBuilding Credit presentation at Cleveland HS, 10/30Next PostHave you seen this wedding dress? A raising of golf fees and future borrowing is part of the plan. A 7% rise will be just the beginning if the new facilities do not generate the expected revenue, and borrowing continues into the future. The bond repayment is linked directly to golf revenues. Parks could avoid future borrowing and excessive fee hikes by choosing the less expensive renovation options and using the extra funds for the deferred maintenance and capital improvements projects right now. Like the cancelled perimeter paths. Page 30, increased operating expenses of larger facilities. $100,000 per year per driving range alone! How is this sustainable? $25,000 per course (excluding Interbay) per year. In Japan most golf courses look like the proposed Parks/Premier Golf project and guess what? Most Japanese can only afford the driving range because the greens fees are too high. Is that where we are headed in Seattle? This proposal is designed to benefit the for-profit operator of the golf facilities, Premier Golf, using public funding and at the expense of our community. In my opinion, a double-deck driving range with taller poles and more intense lighting and the proposed Dwell-style clubhouse are more appropriate in an industrial area rather than in an Olmsted Park. Such a facility may work well at Interbay, but is out of place in a residential neighborhood. While, it is clear that the current clubhouse is in need of renovation, this option was never seriously considered by the Parks department. Instead, the project became a super-sized wishlist to suit the business model of the for-profit operator looking to gain from any potential benefit with none of the risk. The city used its borrowing power to sell bonds to finance golf projects. If it fails to make enough money from these facilities to pay back the bonds with interest, there are only two ways to make up the difference. Golf fees can be raised and/or it can draw from the general fund (which ultimately comes from our taxes). Raising golf fees is tricky since the golfing industry in the US has been in a multi-year decline (http://www.golfincmagazine.com/comment/67760). Please write to the City Council and the Mayor. The planning subcommittee meets this Friday, October 26th at 9AM. They will potentially vote to either approve or disapprove the project. If approved, the proposal will move on to the whole Council, likely next week. I agree with what MIra said regarding the benefit to a private owner from city funds. The driving range height variance for the lights and the poles is a challenge to preserving the views and this will increase light pollution. Finally, the increase in fees is a big issue since this golf course is in a low income nieghborhood and has a long history as one of the most racially and income diverse golf course in the US. I woudl hate the lose the accessibility to the local community including the kids. Private companies benefit from City funds all of the time. Not every pipe-fitter, foreman, engineer, consultant, etc. that works on a City project is directly on the City payroll. Most probably work for private companies that are run by people interested in making a profit when they contract with the City. What is wrong with that? That said, I don’t think the City has a good track record of picking the right companies to run the golf facilities and everyone (golfers and tax payers) would be better off if the City would develop a self-sustaining department to manage golf themselves. If the goal is to keep the fees low, doesn’t it make sense to include improvements that make the facility profitable? For example, adding a banquet facility allows the course to host tournaments with post-round functions. This is currently not possible at Jefferson, and is something that golfers indicated was an important addition. It also provides income from non-golf uses in the form of rental and food service for parties, etc. at the facility. This is something that non-golfers specifically requested from the project during the design meetings. I think the easiest way to keep golf fees from rising for local golfers is to make sure golf fees stay with the golf program. Many feel that golf should not only be self sustaining, but should sustain others as well, which I don’t agree with. Several years down the road after construction of all of the current projects is complete, if golf revenues result in a profit for the city, those funds should be reinvested in golf in the form of reduced fees for local residents, funding for non-profits like First Tee, etc. rather than being shifted out of golf for other programs or non-golf projects, which has been suggested by some. To add to my last post, if you take Mark’s advice and review the financial analysis, you really should understand how it was used in the Master Plan and that it isn’t representative of the current scope of the project. For instance, a major component of the preferred alternative (4B) in the 2009 financial analysis and master plan, the West Seattle driving range, has been scrapped. This results in reduced early expenditures and reduced income over the life of the analysis, with a significant effect on the Jefferson revenue projections. Rather than looking at the numbers for Option 4B, the original preferred alternative, Option 3A is closer to where the process is now, although the timing is screwed up. The Master Plan indicates that Option 3A has the highest surplus of all of the options at year 6 in the schedule. The $100k operating cost per driving range that Mark quotes is only new for the courses that don’t currently have ranges, which is just Jackson at this point. Regarding the Jefferson driving range, the assumption is $35k additional operating costs, with increased revenue of $195k. That sounds pretty sustainable to me. The cancellation of the WS driving range will have a direct effect on the Jefferson revenue, and the installation of the double decker range was part of the justification for cancelling the WS range. The annual driving range revenue for the completed Jefferson range is projected to increase by 15% with an assumed 15% operating expense increase by eliminating the WS driving range. One year of that projected increase ($75k) is more than the capital cost of the perimeter trail. Another significant factor is that the financial analysis uses conservative factors that end up getting reduced in the actual Master Plan for both the Park Fund (constant 5% versus decreasing values from initial 5% to 3.5%) and the capital improvement fund (3% versus actual 2%). That 2.5% may not seem like much, but since it is applied to an estimated $12.5M gross revenue at year 6 it is pretty significant at over $315k, and would completely eliminate the last two years of additional debt. Take it a step further and delay the capital improvement fund payments until the construction is done and it completely eliminates the additional debt, and then some. The Master Plan analysis of alternative 3A actually has a net cash flow of $152k in year 6 and $172k in year 7. Where does that money go? Hopefully back to the golf programs. The additional debt issue is really a non-issue. It just represents a different way to fund 5-6 years of sequential construction projects rather than taking out one huge loan at the beginning of year one. The Master Plan adjustments to the financial analysis for Alternative 3A shows that new loans are not needed after construction is complete (Table 10, Page 70). Financially, the Jefferson project makes the most sense of all of the projects. Right now, the poor conditions outside of the actual course (clubhouse, restaurant, lack of outside food/drinking, and even practice facilities) push golfers to other city courses. Jefferson currently can’t host golf and non-golf events requiring banquet space and food service that could be generating significant revenue that is likely going to courses outside Seattle. The revenue increase is a no-brainer, if you ask me, and overall it appears to pencil out as a good investment that the City should make without further delay. That’s an awful lot of writing from a guy who can’t even write his own last name. It’s Bailey, Chris Bailey. Thanks for asking. I didn’t think anyone would care. You should recognize that message; I sent something similar to you directly several months ago. I said the same thing then that I said here, that the financial analysis, when used properly, does not support your negative representation of the project. History and design issues aside, the project makes financial sense. I did not write the financial analysis. I just posted it. Positive or negative views of the facts are purely subjective. For instance, one golfer I know recently thanked me for sending him this information. Golfers are not aware of the planned fee increases to pay for the new facilities. The Parks department does not talk about the financial analysis during the public process. In fact the Parks representative told a group of people at the NBHC that there were no planned fee increases. Yesterday the same representative told the city council there would be fee increases needed to pay for the improvements. In any case, the history and design of this project is completely subjugated to the purpose of maximizing profits. Premier Golf of course should make a profit. The question is how much influence should a for profit contractor have on the planning and design of Seattle.s public parks, and facilities? According to the Parks department, Jefferson Park Golf is making a profit right now, even in its’ run down condition, which is a testament to the efficiency of the current layout. The costs are relatively low. In the winter the clubhouse closes early, while the driving range is open till 10 PM. Closing the Clubhouse early in the slow season means a drastic reduction in operating costs versus the combined facility. In the new design the whole facility will be in operation until the driving range closes. Lighting, HVAC, staffing will all be increased in the new all in one design. All the features of the new design could be incorporated into a renovation option. We have plans drawn up by a local architect that proves the renovation option could actually double the size of the dining room from the Bassestti design and still provide for the banquet facilities and First tee. So there must be some other reason Parks chose such a radical break with the past..
As you can see in this article, they were apparentely deeply involved. I’m not a golfer, but I enjoy lunch at the clubhouse once a month or so. I have no problem with expanding the driving range, or the hours, or the “light pollution” etc, but I think the clubhouse structure should be preserved. If they were able to move the Pro Shop over to the new place, they would be doubling the function space, and that seems to be one of the sticking points. The clubhouse is the only non-residential building besides the Lawn Bowling Clubhouse (which is from another era) between Spokane and Columbia that has any character. Let’s preserve it.